There is more information available on this subject at Mercury on the English Wikipedia. Retains an atmosphere, as in all post-Traveler records. "No life stirs here. Not anymore." Mercury is the first planet in the Solar System and the closest to the Sun. It is a Vex Machine World. It is also a living consciousness, and one of the Nine. Following its transformation into a garden world by the Traveler, the planet was inhabited by humanity during the Golden Age. At this time, the planet was covered in grasslands and trees with pink leaves. During the Collapse, the Vex undid this transformation  and completely changed Mercury into a Machine World within days of their arrival, using "Lighthouses" to flood the planet with Radiolaria to faccilate its transformation. Dendron, Root Mind arrived in a massive Vex construct to begin seeding the planet with Vex architecture and poisoning all life with Radiolarian fluid. Eventually the Infinite Forest was created to serve as the Vex’ simulation farm, with Panoptes, Infinite Mind at its heart. The Sun itself, as seen on the planet's surface, appears to be massive in size yet not blindingly bright—a possible result of Vex engineering. 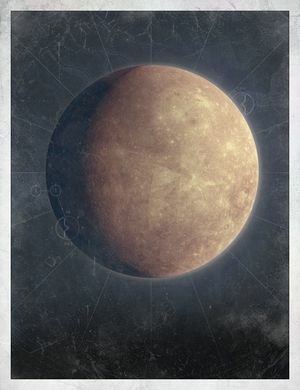 Though much of Mercury is dominated by the Vex, others have managed to visit the planet, including the Cult of Osiris who maintains a camp there in the form of The Lighthouse. Flawless champions of the Trials of Osiris are permitted to visit the Lighthouse where they can find stores of Glimmer and other treasures, although the only rewards available are the ones in the chest at the edge. The Sunbreakers have their Forge here as well and the Cabal built an outpost at Vertigo, but have since mysteriously disappeared. When Saint-14 tried to track Osiris on Mercury, Osiris's trail led him to getting lost in the virtual expanse of the Infinite Forest. The Titan faced the Vex for several centuries, destroying thousands of them. Eventually, the Vex created an Axis Mind specifically designed to drain his Light. Though he destroyed the Mind, it succeeded in its mission by mortally wounding the legendary Titan and draining his Light. Out of respect, the Vex laid Saint-14's body to rest in a tomb in a Simulant Future guarded by Hagios, Reverent Mind (Hagios meaning Saint) and surrounded by the melted shells of all the Vex he killed as a memorial to the grief he gave them. During the Red War, Mercury was partially fragmented to fuel the Red Legion's superweapon, The Almighty. Seemingly half of its mass now exists independently of the rest of the planet. After Dominus Ghaul's death, the Vex began to gather on the planet. Osiris discovered that Panoptes had simulated a future where the Vex would achieve total victory in the solar system and wipe out all other life. Vex from the past and future were converging on this timeline to carry out their plan, but were foiled by the Guardian. It is unknown how Mercury's conversion to a machine world, and partial fragmentation have harmed the consciousness within it. It is also heavily implied in the Dust lore book that it is the Nine who engineered the cut-off of the City's satellites and defenses right before Ghaul's surprise attack, in order to learn how to manipulate Light from him. The Nine also mention how it was "punished" for this act, possibly being its fragmentation at the hands of the Almighty. With the release of Curse of Osiris, Mercury possess the smallest public location in Destiny 2, smaller than even Titan. However, it is the most complex of the maps with the Infinite Gate leading to the Infinite Forest that makes it appear larger, much like Titan, and the Moon of Destiny. In Curse of Osiris, the full width of the Sun appears to subtend an arc of approximately 60 degrees, which would imply an orbital distance comparable to the solar diameter (about 1.4 million km). However, Mercury is 46 million km from the Sun at perihelion to 70 million km at aphelion (its orbit being highly eccentric at 0.21) - about 30 to 45 times more distant. Assuming perihelion, the Sun would appear about 1°45' (1.75 degrees) across - "only" about 3 times larger than from Earth (0.53'). Assuming aphelion, it would be about 1.15 deg (1°10') across, or twice its apparent diameter as seen from Earth. Of course, it's possible the Traveler changed the planet's orbit, but at this distance, it would take much more paracausal effort (unless those powers are so unphysical that it makes no difference) to keep the planet from roasting than it would in its original orbit. (With regular physics, the planet would most likely be doomed.) It's also possible that the effect protecting the surface of Mercury from heat significantly distorts or refracts light at some point between the Sun and the planet, causing the Sun to appear much larger and less intense than it would otherwise.